Charlotte Dujardin and Carl Hester made it a British one-two in the dressage grand prix as the London International Horse Show got under way at Olympia. 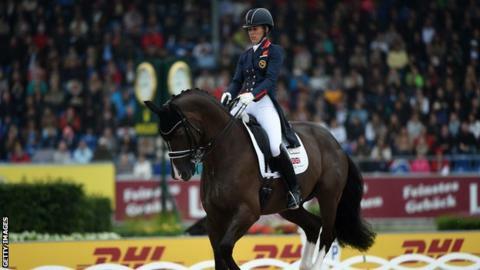 Olympic, world and European champion Dujardin, 30, claimed gold for a fourth successive year, riding the Hester-owned Uthopia. Hester, who won Olympic team dressage gold with Dujardin and Laura Tomlinson in 2012, finished second on Nip Tuck. The Netherlands' Hans Peter Mindehoud took bronze on Glock's Flirt. Dressage continues on Wednesday with the grand prix freestyle to music, before five days of showjumping begins on Thursday, with Britain's world number one Scott Brash in action.